A location that needs no introduction. 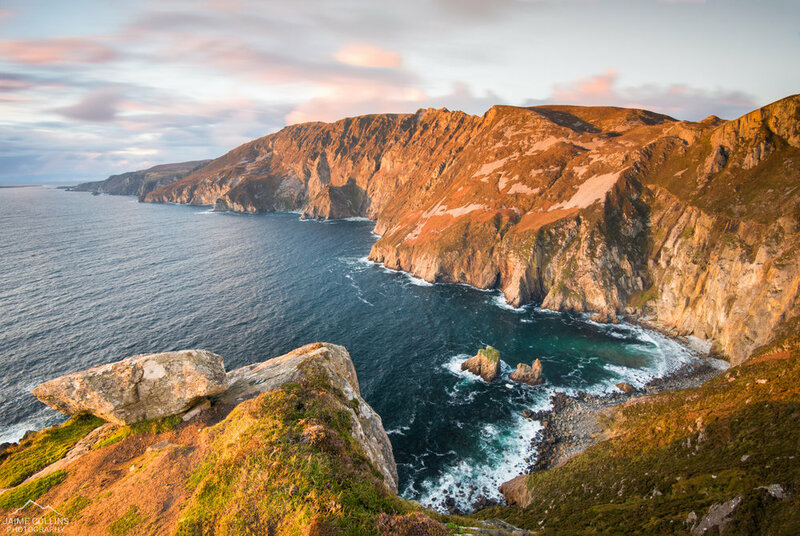 At 601 meters these beautiful cliffs are three times higher than the Cliffs of Moher — and are absolutely spectacular! However my journey here had the beginnings of a horror story. After putting my faith in Google Maps I ended up at the Pilgram Path; which if you don't know is the hiking trail! With so many cars around I figured the path must fork at some point — it didn't... So I ended up hiking to the top, took a quick look at the breathtaking view, and ran back down. On my sprint down I bumped into a lovely couple from Cork who suggested that the view I was looking for might be at Bunglass Point. So I got in my car and drove straight there! Lucky for me they were spot on and I arrived just in time for sunset! It's a good thing I left myself plenty of room for error. Oh and I also got chatting to a lovely American girl — Chiara, who was holidaying in our beautiful emerald isle. From the sounds of it she has already seen more of the south than me!